Ingleton is a pretty village in the Yorkshire Dales surrounded by outstanding scenery. The two rivers that meet in Ingleton, the River Twiss and the River Doe, flow from the north to form the head of the River Greta which then flows south into Lancashire these two rivers make the visit to Ingleton Waterfalls a wonderful experience. Ingleton is very popular for walking, caving and visitors. Ingleborough one of the Three Peaks can be walked from the village to a height of 2,373 feet giving wonderful views of the Yorkshire Dales and if you are more experienced you could walk The Three Peaks Challenge which includes Ingleborough, Whernside and Pen-Y-Ghent giving you 25 miles of outstanding natural beauty. For those that prefer to go caving there are the nearby White Scar Caves, Ingleborough Cave and Gaping Gill and for the more experienced the area has a labyrinth of challenging potholes and caves which have been formed by 300 years of old limestone rock which has gradually been dissolved by groundwater. Ingleton village has a number of 16th century buildings and there are the remains of an agricultural past. The old bullring, where animals were baited and slaughtered many years ago, is still visible in the tarmac. The village hosts two pubs the Craven Heifer and the Wheatsheaf Hotel, cafes, a post office, a Co-op and many other shops. 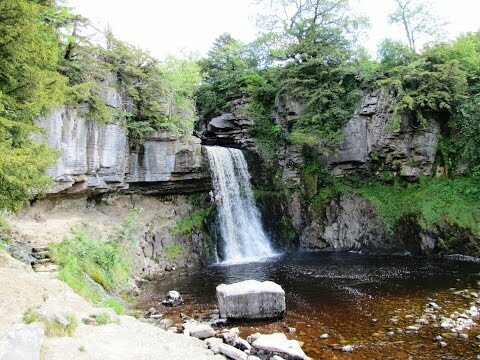 Ingleton Waterfalls Trail first opened on the 11th April 1885 with an entrance fee of 2d today the fee is £5 per adult and £2 per child under sixteen years of age. The trail is open every day except Christmas Day and opens at 9am closing times vary according to time of year. The falls are so popular that in 2005 the Falls Cafe and facilities was opened to provide that bit extra for the vast amount of visitors and this year, 2011, The Falls Refreshment Centre opened which is situated half way along the trail at Beezley Farm just before Beezley Falls. It is recommended that you take a camera because the beauty of these falls and the woodland scenery is a photographer’s dream. We park in the Waterfalls Trail car park. Admission is £5 each. We head to the back of the car park to pick up the path and just keep following the paths and tracks crossing the bridges as we come to them until we reach Thornton Force. The first section of the walk follows the River Twiss through Swilla Glen, a deep glen cut into carboniferous limestone. We then cross over Manor Bridge and follow the path to First Pecca Falls then cross back over the river at Pecca Bridge and after a short way we come to Pecca Twin Falls which has five main waterfalls that drop 30metres over sandstone and slate. We then climb steeply up a series of steps passing Hollybush Spout to the top and the refreshment cabin. We then walk on to Thornton Force where the river plunges 14 metres over a limestone cliff laid down 330 million years ago in a sub-tropical sea this is the most spectacular of all the waterfalls on this trail. We then carry on following the path to Raven Ray where we cross a footbridge then follow the steps uphill to Twistleton Lane, this is an old roman road and the views of Ingleborough are fantastic, here we turn right and follow the track through a gate, passing to the left of Twistleton Hall where we head for the road and the River Doe that we can see down below. We cross over the road and turn right in front of the The Falls Refreshment Centre and head forward on the path. We enter the oak woodland and we are now following the River Doe to Beezley Falls. We then head forward to Triple Spout, which consists of three waterfalls side by side next we come to Rival Falls where the River Doe plunges into an 80 feet deep pool known as the Black Hole. We carry on following the path to Baxengyhll Gorge where there is a viewing bridge with a dramatic view of the river far below. We then carry on for a short way and look back to view Snow Falls, the last of the Waterfalls. From here we continue forward, crossing a bridge, through Twistleton Glen, through the old limestone quarries and an old workings on the left and follow the track bearing left until we come to a road. Here we turn right and walk through the village of Ingleton, following the signs for the waterfall walk, over the river bridges and back to the car park. A moderate to hard walk with steep inclines and declines. Approx 4.75 miles using OS map OL2. Ingleton Waterfalls Trail car park at Ingleton in the Yorkshire Dales. There are toilets near the entrance to the waterfalls and at The Falls Refreshment Centre and a radar accessible toilet in the community car park. For refreshments there is The Falls Cafe at the entrance to the waterfalls, a cabin just near Pecca Falls and then The Falls Refreshment Centre about half way round. In Ingleton itself there are two pubs, cafes and a variety of shops including a Co-op, post office. PS would be pleased to receive your reply. Hi Alan Pleased to hear from you thank you for your lovely comments. Myself and my wife make these videos in our spare time. We are trying to build a website of guided walks with commentary that makes it easy for tourists and holiday makers to walk with confidence hopefully nationwide but it is a slow job as we are both working. A lot of people are now starting to watch our videos for entertainment as well as for walks which is very nice and its the great feed back like yours that keeps us going. Please take a look at our latest walk Helvellyn from Glenridding we were lucky enough to film a helicopter landing on Striding Edge. Hi, thanks for this recommendation for a great walk. I just had to do it. Travelled from Hertfordshire, paid £6 entrance and took my dog Koda for a wonderful walk. Took 2.5 hours and I brought a packed lunch. It was a great half day mini adventure. Lots of free parking. There had been heavy rainfall the previous night, so the pathway was wet and slippery. The pathway goes through the forest and snakes alongside the waterfalls. It can be a tough walk in places but well worth it. This circular walk would be great to complete in different seasons, to see the changing landscape and natural beauty of the waterfalls. Thanks for your recommendation! We are off to Whitby for our next mini adventure, the dog and I. In my opinion there are sreavel things that make this a good image.First, the setting within the firs. This perspective is striking and different from most waterfall images.Next, the sharpness and detail visible in the trees. It is crisp and well focused. Lastly, your choice of high contrast processing makes fine highlights in the trees stand out even more. Looks great in black and white.